A high number of accidents occur due to a lack of observation when overtaking or changing lanes, in particular, not checking the blind spot. A cars blind spot is an observational area that cannot be viewed by looking in either the main rear view mirror or the side mirrors. This blind spot, typically either side of the vehicle can be quite large. A car, cyclist or motorbike can easily be concealed in the blind spot. A significant amount of accidents can be reduced if the blind spot is checked before changing lanes, especially on high speed roads. This section offers an explanation of the car blind spot, when the blind spot must be checked, plus the dangers associated with not checking the blind spot. In this diagram of a cars blind spot, the blue shaded areas indicate the areas where the driver of the red car cannot see anything in the side mirrors – the blind spot. Looking at the red car in the diagram, we can see that he can see the orange car in the right side mirror. The yellow car however is totally out of view of both the drivers field of vision and the left side mirror. The red car is unlikely to know of the yellow cars presence unless he checks the blind spot to the left. 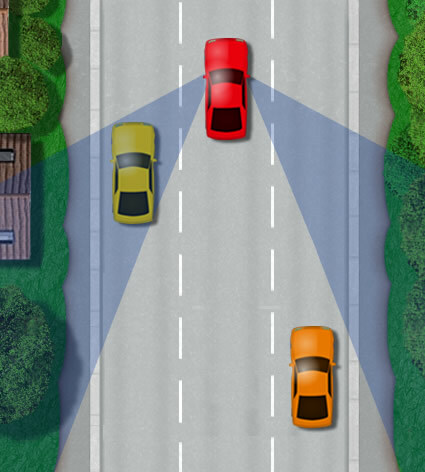 If the red car would like to change over to the left hand lane where the yellow car is, he would need to check his mirrors initially and also look over his left shoulder to check the left blind spot which his mirrors do not cover. When should the blind spot be checked? Essentially, just before you intend on changing lanes. This can include but not limited to dual carriageways and motorways and multi-lane roads within towns and cities. Learner drivers on a driving test must check the right blind spot before driving off. A cyclist could be in the right blind spot just as you are about to move off into their path. Failure to check the blind spot before moving off during a test will certainly result in failing. Blind spots also need to be checked more frequently in busy towns and cities where cyclists are present. For instance, if you are making a left turn, you will of course need to check your mirrors before making the turn followed by a signal. Even after following this procedure and making it clear for your intention to turn left by signalling, cyclists all too often cycle past you on the left. Checking your left blind spot in these situations is important. Do I always need to check the blind spot? Blind spot mirrors are available that claim to cover the field of vision that a cars standard mirrors do not. These mirrors certainly broaden the field of vision. Even with these claims, it is still recommended that you always check the appropriate blind spot before changing lane or direction.